The combination of the Springs Fire in 2013 and ongoing drought continues to fell trees in the park. The trail crew spent many extra days of clearing downed trees and large limbs of the trails. It is sad to see how many trees we have lost these past couple of years. 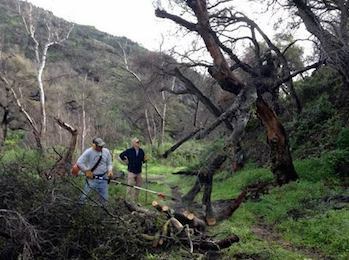 With the donations we have received, the Santa Monica Mountains Trails Council has purchased gas-powered saws and additional pole saws. Our ongoing relationship with students of California State University Channel Islands continues. In the four special work days with the students, they contributed a total of 576 volunteer hours. 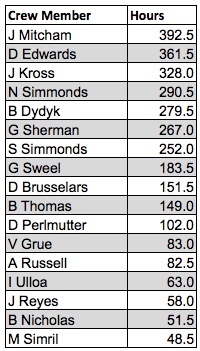 This event is a win/win for everyone involved. 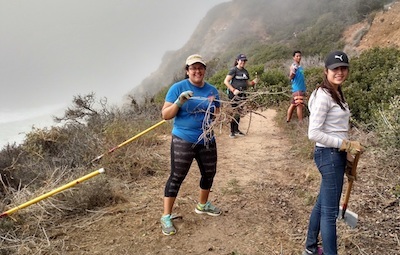 The students get to be outside working on our trails with our capable trail crew and are then exposed to the beauty of the Santa Monica Mountains! We have also hosted groups of students from USC and Pepperdine. 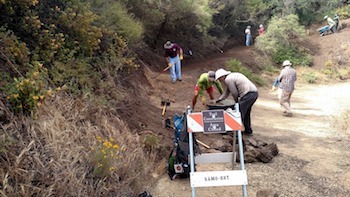 The crew accomplished two special projects on the Camp 13 Trail in Leo Carrillo State Park. 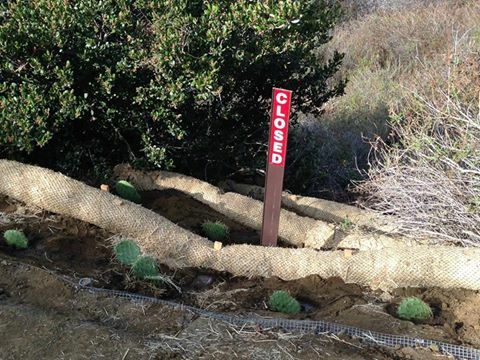 We installed two Sutter walls -(retaining walls), several wattles and planted native plants to repair and prevent severe erosion. The Camp 13 trail is an Americans with Disabilities Act Accessible trail near Leo Carillo State Park. 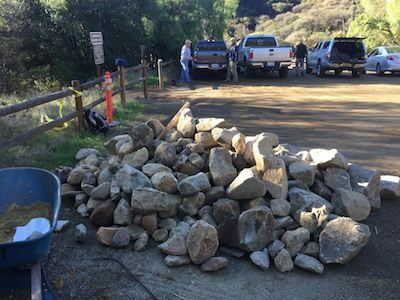 At our request, NPS delivered approximately one ton of rocks to the trail head for the Grotto Trail. 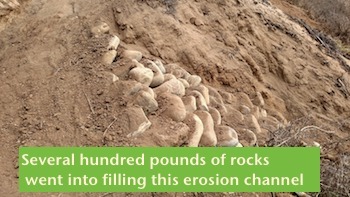 The crew then moved these rocks down the trail and installed them into an erosion control feature. Water flows downhill and takes away the tread piece by piece. Most of the work we do involves channeling the runoff by creating water diversions and repairing damage done by water and exacerbated by trail use. During a small brush fire near the Staircase Beach Access Trail, the fire crew cut a fire break, leaving a large stretch of completely bare ground on a steep slope near the trail. The trail crew installed several waddles to mitigate erosion and a substantial drain to divert water away from the trail. 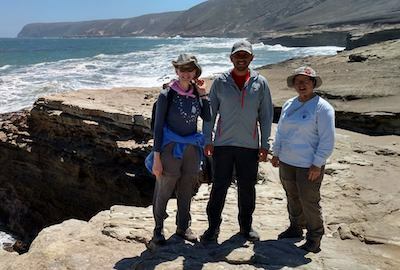 Continued our support of trails in Channel Islands National Park with five, multi-day working trips, and 490 volunteer hours to the islands. Successfully led several volunteer crew during Trail Days, contributing resulting in a total of 774 volunteer hours and 2.6 miles of trails maintained. 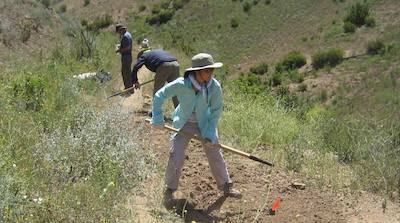 This is our premier event and offers volunteer trail work hours for most abilities. Many friendships have developed over the course of a days' work. Come out and join us April 28-30 2017.